Sogou AI Open Platform and Kneron, a leading provider of edge Artificial Intelligence (AI) solutions, today announced an innovative edge AI solution that integrates Sogou’s speech interaction1 and Kneron’s visual recognition technologies. This solution, which supports both online and offline applications, can be applied to smart home, smart surveillance, automotive electronics, robots and IoT devices. It can run deep learning on the edge devices to meet the needs of quick response, safety and privacy in the offline state, and also can build up an interactive AI platform by connecting to Sogou’s cloud. Based on Sogou’s natural audio interaction of search engine, Sogou’s speech interaction technology is not only able to “listen and say”, but also to “understand and think”. With the professional experience in Internet market and data processing, Sogou’s speech interaction solution is faster, more correct, as well as supports more complex interaction and both online and offline functions. The speech recognition accuracy is over 97%. Kneron’s visual recognition solution adopts exclusive Reconfigurable Artificial Neural Network technology, which can be quickly applied to different applications. 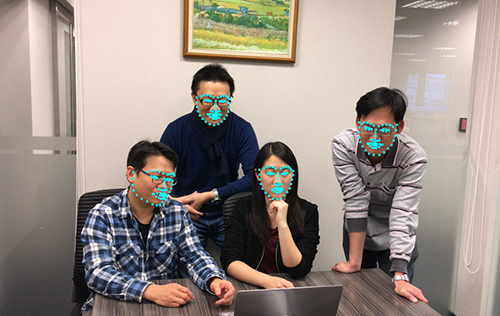 This solution can recognize human face, body, distance, number of people, gestures and motions, and then respond promptly according to the recognition results. After integrating Sogou’s speech interaction technology, users can also interact with the devices via voice commands. The solution can do real-time recognition, inference, and analysis with no need to connect to the cloud, so that users can keep their privacy. Taking smart home for example, when someone enters the room, the edge visual and speech recognition solution can recognize who came in and automatically turn on the lights, air conditioners, or the other equipment. If more people enter the space, the temperature, air volume and wind direction can be automatically adjusted. If strangers enter the room, the notice message will be sent to the home owners. In addition, users can give voice commands to turn on the TV and select channels, play music, dim or shine the lights, connect to the cloud to search for weather and traffic information, and order restaurants and tickets. 1 Sogou’s speech interaction technology can support English, Mandarin, and Cantonese currently.